Mojo Monday ~ Bread and Roses – We Are All Meant to Shine! I was steeped in an eclectic blend of music growing up as a child. The beginning influences came from my parents and my older siblings. My parents love music and in their younger days my dad saw Elvis in concert and my mom loved listening to the likes of Sarah Vaughn. My parents are in their 70’s now, but their calendar is still full of concerts they will be attending. My parents started taking me to concerts when I was just a kid too. I tagged along to various jazz festivals and blues concerts. My older brothers exposed me to the music of the Jackson 5, Bay City Rollers, and later hard rocking bands like Led Zeppelin and AC/DC. One of my older sisters was listening to more to artists like Barry Manilow, the Bee Gees and other pop wonders. Between them all I was exposed to rock, folk, disco, country, blues, soul, jazz and the list goes on. Music became a soundtrack to my life. If my 10 year old self was feeling sad I knew just the 45 to play with a song called Bluer Than Blue by artist Michael Johnson. If I was in a rollerskating mood then Michael Jackson’s Off The Wall was my first choice. I toyed around on the family piano as a child and then took guitar lessons for a couple of years. I returned to the guitar as a teen, but my ability as a musician seemed quite limited. I was okay with it though. I had my record player and later 8 track and cassettes to fulfill my music needs. 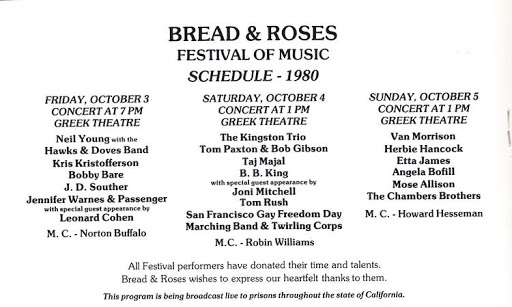 One particular series of concerts my parents took me to as a child were called the Bread & Roses Festivals of Music. These concerts in particular had a big musical impact on me. 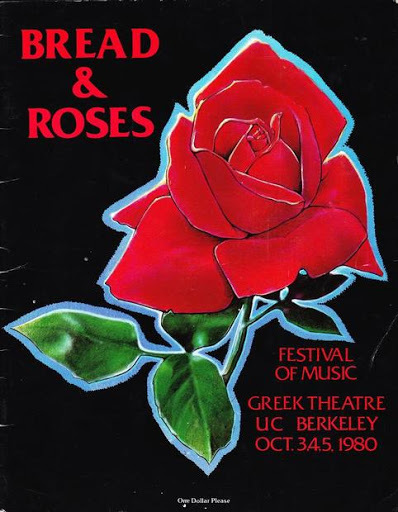 One we attended took place in October 1980 at the Greek Theatre in Berkeley, California. I was only 11 years old. We would put out our blankets and sit on the wide concrete steps. You can see from the program image below that the line up of artists was incredible. Another year we also saw Joan Baez, Paul Simon, Graham Nash, the Smothers Brothers and Peter, Paul and Mary perform. That year we were also entertained by the MC talents of manic comedian Robin Williams. The story about how Bread and Roses came into being is very inspirational. It begins with a vision of a woman name Mimi Farina, sister to Joan Baez. Here is the excerpt from the web site for Bread & Roses. “Every successful organization starts with a visionary founder. Ours was Mimi Fariña. She was the energetic, goal-oriented, passionate person who had the idea, was willing to take the risk, and was able to sell the vision of Bread & Roses to others. 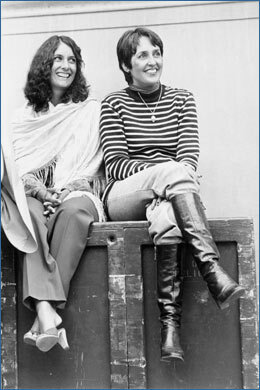 Mimi was a petite ball of fire, a meticulous writer, an inspiring speaker, a fine songwriter, and a fabulous performer. As a child, she was an excellent dancer, and played the violin. As a teenager, she mastered the guitar. With her late husband, Richard Fariña, she entertained and inspired audiences in the 1960´s with original folk music until Richard´s untimely death in a motorcycle accident in 1966. Mimi continued to perform professionally for many years – both solo and with others. In 1972, she attended a live concert with B.B. King at Sing-Sing Prison in New York, and she was deeply moved. She had seen the healing exchange that occurs between performer and audience at least once before at a performance for patients in a mental hospital. Not long after the B.B. King concert, her cousin invited her to perform at the halfway house that he managed. This time, the seed for Bread & Roses was planted. Mimi began to think seriously about creating opportunities for performing artists to bring the joy of live entertainment to people shut away from society. She said it was like writing a song. Recruit high quality professional and amateur artists who (a) have a natural rapport with their audiences, and (b) will volunteer their time. Provide all performances free of charge to client facilities. Garner other volunteer resources, sound and light technicians, photographers, and the like, to reduce production costs. Treat volunteers, donors, and clients with grace and gratitude. Not everybody can do what Mimi did; take a powerful idea, keep the principles simple, and execute with heart and soul. Mimi created a successful, nonprofit organization that serves other nonprofits and uplifts tens of thousands of people every year. Her accomplishments were recognized by many organizations over the years, including The Easter Seal Society (1989), National Academy of Recording Arts & Sciences (1993), League of Women Voters (1998), and the National Association of Women Business Owners (2000). Although Mimi had planned to retire in 2000, she suspended participation in the daily affairs of Bread & Roses in November 1999 when she was diagnosed with cancer. However, she continued to assist the organization in many ways. In March 2000, she served as the beautiful and eloquent hostess for our 25th Anniversary Celebration. She continued to inspire and uplift the staff and board with her ideas and her humor. She illuminated our path, set an example of excellence and kindness, and reminded us how important our work is to our audiences and to our volunteers. Mimi died on July 18, 2001, at her home on Mt. Tamalpais in Mill Valley, California, surrounded by her family and close friends. Her vision lives on in the form of Bread & Roses today. Bread & Roses is dedicated to uplifting the human spirit by providing free, live, quality entertainment to people who live in institutions or are otherwise isolated from society. Our performances: enrich the soul and promote wellness through the healing power of the performing arts; create a sense of community for our professional performers, in a non-commercial setting in which they can donate their talents to inspire and be inspired; provide an opportunity for non-performing volunteers to contribute a variety of skills and resources that support our humanitarian services and increase the impact of donor contributions. In carrying out this mission, Bread & Roses seeks to create a social awareness of people who are isolated from society, and to encourage the development of similar organizations in other communities. Here are a couple more quotes from artists who serve as volunteer performers for Bread & Roses. What is your relationship with music? 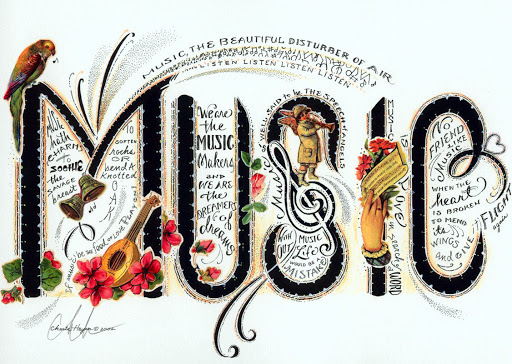 Has music played a significant role in your life? Are there certain songs that have been part of the soundtrack of your life? Any favorite songs you’d like to share with us? Had you heard of Bread & Roses before? What do you think of this program? If you are feeling sad right now come listen to my childhood “sad” song called Bluer Than Blue — I have to say finding this video brought back memories but also made me laugh a bit and also feel extra tender for my precocious childhood self. ← Mojo Monday ~ If Not Now, When?